There are several perks to marrying an Englishman -- and no, I’m afraid I’m not charmed by the accent (when we met, my husband’s Oxfordshire dialect was truly inscrutable, and after ten years of marriage, I don’t care if the children need a baath or a bahth -– just get the urchins, er, darlings, in the bleedin’ tub). But as for the perks: first, as I have recounted before in this blog, Oxford, England, is a pretty sweet destination when you have to travel to visit the in-laws. Next, I love pub gardens, and (my hips don’t lie) I happen to like heavily larded, starchy food. I listened to the Arctic Monkeys (and James Blunt and Coldplay, etc.) long before they were over-hyped here. And if you’re a language enthusiast as I am, when you procreate with an Englishman you enjoy a burden of riches when choosing a name for your son’s private parts. Pee-pee? Hoo-hoo? Pfft. Nothing suggests the impotence of our language more than the limp handles I hear in family lavatory stalls. Marry an Englishman, though, and your boy can have a willy, knob, or winkle. Chopper, plonker, or savaloy. Twig (and berries), meat (and veg), or John Thomas (and his two swingers). See Monty Python’s The Meaning of Life if you require a more thorough schooling -- we settled on “tadger.” This milestone behind us, we were free to devote ourselves to other rites of English manhood, such as throwing ourselves into the men's World Cup. Every four years, a crop of Europeans (e.g., Geoffrey Wheatcroft) and former ex-pats (e.g., Adam Gopnik) deign to inform us why the rest of the world watches World Cup soccer and why Americans don’t, or shouldn’t, or should. We’ve read it all before: for the next six weeks, tens of millions of world-wide soccer fans will call in sick, stay up late, carry radios, crowd the telly, and otherwise put themselves and their countrymen out so as not to miss a minute of play by their national side. As our pastimes should say something about us as a people, the journalists use the quadrennial exercise to illuminate differences in national character, when in fact, disparities in world-wide attitudes toward soccer reveal global similarities in tropes of masculinity. On one level, the barroom conversation that soccer inspires in our country amounts to an international tadger competition -- "our sports are bigger and better than yours." On another level – I hate to say it, Mia, but somebody’s got to – the American soccer scene has yet to galvanize because so many think it’s a sport for girls. As U.S women’s soccer achieved world dominance (along with the U.S softball team), soccer in America became increasingly emasculated, more about baring sports bras than penetrating the net. But fret not, gentle countrywomen, or consider such boorishness cause for despair. For while Julie Foudy, former U.S. women’s captain, is game to call the men’s World Cup on the Fox Sports Channel (as she did four years ago), I have yet to read a rousing homily on World Cup soccer written by a female transnational, or, even better, a foreign female player. Indeed consider the alternative, if we lived abroad: while women in America have advanced in sport (thanks chiefly to Title IX, which guaranteed them the opportunity to play competitively in college), in the many nations devoted to the “people’s game” -- so-called because all you need to play soccer is a ball of some kind -- women sit in the stands, at home, somewhere far off the pitch. From this perspective, our ignorance of men’s World Cup soccer testifies to one instance of national, or federal, insight (pass the ERA and pay us dollar for dollar, and I'll gladly withstand some sports-related boorishness). Soccer will never displace baseball or football in the hearts and TiVo WishLists of men, as a quadrennial tournament supplies neither the ritual nor reward that US sports fans expect (annually) from our resident athletic contests. But just as most learning curves favor women, and many men will spend the summer pouring over box scores or glumly waiting for training camps to open, the smart woman can tune in to the men’s World Cup: allow me to offer a primer. It feels gratuitous to bring up the beekcake factor, but seeing as it's indisputable, let's get right to it. Sure, David Beckham looks nice in a skirt: if soccer produces one thing, it’s a set of nice legs. But allow me to submit for your consideration one Michael Owen, a striker (goal-scorer) from Liverpool, England. My, has he matured nicely. Owen rocked the soccer world eight years ago in the '98 World Cup, with a goal that took him dashing and gamboling with the ball from the midfield line past one Argentinian defender, then another (! ), to finish by toeing the ball well over the head of the befuddled goalkeeper and into the back of the net. Men cowed at the offensive trifecta -- I marveled at Owen's sheer grace, his ability to anticipate the defenders' movement (before even they knew how they would move), and dodge and feint on his feet to speed right past them. If you complain that a sport played only with the feet can’t be challenging, I dare you to dribble a ball past merely an immovable object (or your nearest Argentinian). And if you usually tune in only to figure skating or gymnastics, you won't be disappointed by what is truly a breathtaking display of poise and agility, and, even more impressive, a routine being made up on the spot, (indeed) on the fly. 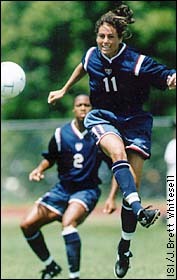 Of course, if long, lean and lanky is more your style, you must see the swift gait of French forward Thierry Henry. A genius goal-scorer, with legs my own height, the man is indubitably half-gazelle. A key player in (England club) Arsenal’s offense, Henry will be essential to the French line-up this year, especially as French captain, Zinedine Zidane (“Zizu”) looks ready for his retirement. As for Michael Owen, the former boy-wonder has lost some pace since ‘98, having suffered a crippling hamstring injury and eight years of professional play having taken its toll. But England is counting on Owen this tournament, as his superstar successor, Wayne Rooney (sorry, no looker, kinda looks like a bulldog) injured his foot. (Without fail, the crucial player from England always gets injured just prior to the World Cup; it was Beckham in ‘02.) I think Owen will be up to the challenge. He has matured nicely, and while he has lost that ingenue's indifference to "you can't do that," his experience will prove vital to the England side. Both Owen and Henry will score when it counts. But of course a soccer tournament is not just about one player scoring -- nor is it only about England and France (don't tell my husband, and I won’t take the French defeat personally). Viewers who complain that soccer is just 22 men running around for 90 minutes -- and let's just pause to consider the last time you ran around for 90 minutes, with only one break, and no TV time-outs (one reason soccer doesn't play for the networks here) -- never made it past Candyland or Chutes and Ladders to play a good game of chess. In chess, each piece has its assigned role -- the bishop can move diagonally, the rook back to front, side to side, but collectively the pieces are moving together, which is to say, they share the same goal: to capture the opponent’s king, and defend their own. Within this framework, the pieces can vary their play -- the pawn can go diagonally to capture, for example, and that rook -- whoops, castle! And they all can be sacrificed, save for the king, to fulfill the team’s purpose, to knock out the opponent’s king. For the most unbelievable, inventive, creative, just crazy-ambitious plays, watch the Brazilians. For sure, they're not pretty up close (though you gotta love the names: Ronaldinho? Where can I get a name like that? Jardininho? I like it.) But the Brazilians amaze for their flair and finesse and for making plays happen. Joga bonita? Too true. Four years ago I was up at 3 in the morning nursing my son, a feeding scheduled to watch the World Cup England-Brazil match played in Japan. England was up, incredibly, just before half-time, when bloop! Brazil scored. Five minutes into the second half, and bloop! Brazil scores again. Within ten minutes of play, Brazil scored two incredible, gob-smacking (and in this household, heart-wrenching) goals. You may have already seen the Nike commercial in which former French footballer Eric Cantona (filled out considerably since his playing days) observes a toothy, ever-smiling, tween Ronaldinho play soccer with such enviable joy. The Brazilians all play that way, blithely disregarding the "you can't do that" factor as a team, gleefully throwing caution to the wind. By contrast, the German side is all achtung, baby. Germany scores one goal, then positions its players in front of their net to defend for the remaining minutes of the match, as if you surrounded your king with your most powerful pieces and then only fiddled about with your pawns. Maybe you relate to such caution. For me? Boring. Cowardly. Blech. But Germany wins that way, or used to. In the last Cup they were in a transition from the old guard to the new, but still made it to the final; this time they are at full strength and have home-pitch advantage. I filled out the Cup bracket, and while I would love to see an England-Argentina final, it's hard not to foresee a Germany-Brazil rematch, the home team versus the reigning champs. If that's the case, it will be entertaining if only to witness two patently different styles of play, and yes, two distinct national characters. What do you want in your man, stoic caution or romantic ingenuity? Cast your wager accordingly. Who else should you tune in for? If it's swarthy, and stereotypical, machismo you go for, look for the Italian and Argentinian teams. The Italians play rough, and the Argentinians? Well, they're not known for fair play (Google "Diego Maradona" and "the hand of God"); if the kids are nearby, you are bound to witness a “teaching moment.” If precision interests you, and you demand that your office or household run like a Swiss watch, the Holland team offers measure in great measures. The Central American teams (Mexico, Costa Rica) are free-flowing, like a cool Margarita after a long graft in the garden. And, as in the Olympics, Eastern European teams have begun to fare well, the most recent surprise being Croatia; in this tournament, the Ukrainian team has a good chance to upset. They are not only blessed with the gifted Andrei Schevchenko, but they also thrashed the other teams in their qualifying group (the first team to qualify for the World Cup), thus proving themselves competent as a team. Finally, it being a World Cup, Far East (Japan, South Korea), Middle East (Saudi Arabia, Iran) and African (Ghana, Angola) nations field teams; while none of these teams are expected to contend, they are worth tuning in for to witness the enthusiasm their fans show in seeing their teams play on an international level, and for what compelling geo-political match-ups might take the pitch (e.g., Iran v. US in the last World Cup). Of course, our household will be rooting for the three lions of England, but it would be unpatriotic — and unfeminist -- of me, however, not to conclude with some reflections on the US team, however sadly they do tend to disappoint. From a competitive standpoint, the US suffers from a lack of speed (comparatively, it's as if they run and pass in slow-motion) and (again sadly) a lack of confidence, as if they have internalized the nation's indifference to them and have to prove to us that soccer is a sissy sport. Logistically, the US team suffers because, despite AYSO’s claim on family weekends nationwide, the program is not a feeder system. In the countries in which soccer is revered, boys are not only kicking cans at the first opportunity, but the schools and national football associations are also looking out for talented five year olds to deposit immediately in the nearest training camp. My husband was taken out of school at fifteen to play for his local side. Needless to say, we won’t let that happen here: while we are a sports-obsessed culture, and the NBA continues to pluck the occasional prodigy straight out of high school, many professional sports still run through college first. AYSO is age-limited, like Menudo, and no connection exists between AYSO and the sports children take up later, at school -- sports in which they are gender segregated. For indeed we might also consider how AYSO differs from other national youth sports programs, in that boys and girls play soccer together. Learn sportsmanship, fair play, get some fresh air and exercise. Follow that ball around the field like a frenzied swarm of bees. (Kick it, somebody, anybody, kick it!) It is possible that a program that led many to believe we would become a soccer-obsessed nation had the opposite effect precisely because its messages — “everyone plays,” even girls -- were contradicted, long-term, by the messages of more institutionalized sports, as well as the institution of gender difference, which Title IX inadvertently reaffirmed. We are indifferent about soccer because it lies along the fault lines of national ideas about sport, and yields no clear basis on which to develop either a coherent fan base or a tradition. Which leaves it to our national men’s side to prove that soccer is competitive (for both men and women), by going out there and proving they can compete. Tadgers out, men! Get stuck in! Women’s soccer — the soccer nation? -- is counting on you. To think that I thought "tadger" was spelt "todger". I'm glad I was never called upon to help anyone with the correct spelling. My Outlook Express would never have found it on spellcheck. One other thing...I will never be able to have a saveloy & chips again! I am mightily impressed with your football knowledge! England are playing today & I am heading over to the pub at lunch time to catch the second half...it's a little nerve wracking.